Practically all CPrint shops have 20 or fewer workers, most are in the 4 to 12 range (including owners) – although some are bigger and some smaller. Sales are anywhere from $200,000 to over $3 million, but mostly in the $300,000 – $1.2 million range. Most shops are owner-managed and have a single location. Many are operated by the founder although a few go back many generations. Essentially we are family-based business owners who happen to be printers. Half of us have a family member working with in the business and one-fourth have a son or daughter in the business. As for equipment, most have digital output device such as the Konica-Minolta 6500. Many of us, provide or sell wide-format services and thus are involved in point-of-purchase displays as well as signs. Some provide marketing services such as websites and email broadcasting. Most of us have or recently have had offset equipment. For those that still do, we generally have true two-color presses such as the Heidelberg PrintMaster or the Ryobi 3302. We print pleasing color as well as one and two-color work. Additionally, about one-fourth maintain a mailing operation. Most have a standard light bindery as well. As for offset equipment, many have true two-color presses such as the Heidelberg PrintMaster or the Ryobi 3302 and we print pleasing color as well as one and two-color work. Digital printing generally supersedes offset work in most shops. Why not see how CPrint can serve you? 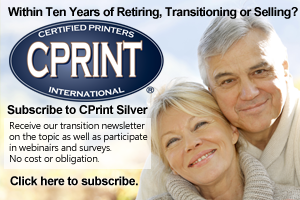 Email Tom Crouser tom@cprint.com to start a conversation. At CPrint® we help printers prosper.